Asad Khalil Abu-Mulal al-Balawi is free after being held since last week's attack in Afghanistan. Jordan says he was held for "suspicion of links to a terrorist organization"
Amman, Jordan (CNN) -- The brother of the man named as the suicide bomber who killed eight at a U.S. base in Afghanistan last week was released by Jordanian authorities Friday after having been held since shortly after the attack, his family said. A senior Jordanian source said the detention was not in connection with the Afghanistan attack, but for "suspicion of links to a terrorist organization." Asad Khalil Abu-Mulal al-Balawi was picked up hours after his brother, Humam Khalil Abu-Mulal al-Balawi, allegedly set off a blast at a U.S. base in Khost, in southeastern Afghanistan, on December 30, killing seven CIA officers and contractors and a Jordanian army captain who was a cousin of Jordan's King Abdullah II. Al-Balawi's family said Friday that Asad, 29, who lives with them in Amman, was being held by Jordan's intelligence agency. The senior Jordanian source, who could only speak on condition of anonymity, confirmed that Asad was arrested December 31 and "detained for questioning," but "not in relation to his brother." The source did not say to which terrorist organization the brother is suspected of having links. Asad Khalil Abu-Mulal al-Balawi's family insisted he is innocent. He is a computer engineer and a member of the Jordanian Engineering Association, his family said. 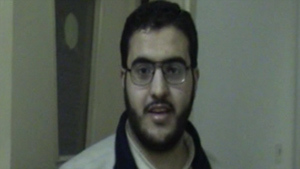 Humam Khalil Abu-Mulal al-Balawi, the suicide bomber, was a double agent, according to a former U.S. intelligence official. He was recruited as a counterterrorism intelligence source, according to a senior Jordanian official. The former U.S. intelligence official said he became a double agent for al Qaeda. Defne Bayrak, his Turkish wife, said she was shocked to hear what he had done, she told CNN Turk television. Despite the shock, Bayrak said she's proud of what her husband did. "My husband accomplished a very big operation in such a war," she told reporters in another interview. "If he is a martyr, may God accept his martyrdom."